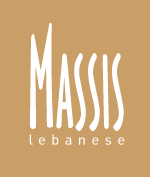 Massis is an authentic Lebanese restaurant. Traditional spices and flavours make each offering an experience for the senses. Mezze, main dishes, fine wines and exquisite cocktails are all on the menu. The cooking is fresh, flavourful, diverse and invigorating in its simplicity. We invite families and neighbours to come together in a relaxed setting to gather for a drink and stay for a meal.